"I just see myself as a bike racer" - but ultimately, Maria Costello is much more than that. A pioneer, an educator and a pretty quick rider to boot, Costello hopes that her impact on motorcycle racing can inspire a new generation of female racers. 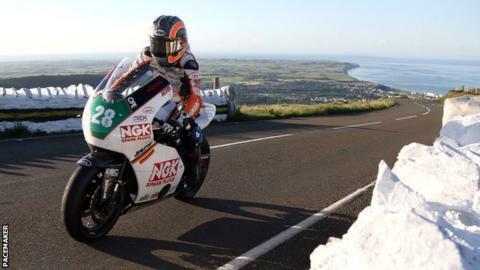 The Northamptonshire native was the fastest woman around the Isle of Man TT course, and was the first ever female to claim a podium finish around the notorious Mountain Course. Awarded an MBE in 2009 in recognition of her career as one of Britain's leading female racers, the 45-year-old is hoping that other women can follow in her wheeltracks. "I think my role has become that of a pioneer," admits Costello. "I've been around for such a long time now and I like that but it's great to see more girls coming into the sport. "I try to keep an eye on what they are all doing and there have been some great successes. I hope we see even more from female riders, especially in road racing. "Initially, it's about getting parents to understand that their daughters can try motorcycles. That was difficult for my parents, they really didn't get it, and that is where more racers are going to come from." Ana Carrasco broke new ground in 2018 when she clinched the World Supersport 300 championship, becoming the first woman to win a world title. "Ana started racing when she was really young," explains Costello, "her parents were really in tune to that. It just needs to be seen as not a gender thing and from that more young girls will start out. "I've been around for 23 years and there are more girls coming in, but not in the numbers I would have thought. "When I first started I thought there would be a massive influx. It was really popular and women were taking up two wheels on the roads but it just wasn't filtering into racing. " Costello hopes that more can be done to encourage women to get involved at the earliest opportunity. "It's really important to highlight what women are doing in the sport because that helps other young girls see that there are career options for them on two wheels," says Costello. "I think it is down to the governing bodies to encourage more girls to take it up among the grassroots side of things. "I love doing talks in schools and I've been doing some careers events in primary schools - it's great when kids or students come up to you and say they want to be a bike racer. "It hadn't been open to them and they didn't know it was an option. I know their parents might think the same but that's where the education needs to come - that it's probably safer to be racing than potentially riding just on the roads. "I just see myself as a bike racer, but you can't ignore the wonderful messages I get saying 'I wouldn't have ridden a motorbike if it wasn't for you' or 'I wouldn't have started racing if it wasn't for you'. It means the world." Costello hopes that she can not only inspire other women to take up racing, but to do so successfully, adding that seeing females occupy the top step of the podium on a more regular basis "would be awesome". She is still competing at the highest level of road racing, and is focused on competing and battling for podium finishes. Back riding a Supertwin for 2019 at the international road racing events, starting at May's North West 200, Costello is hoping she can keep improving. She also competes at the Classic TT, claiming a rostrum spot in the 500cc race around the 37.73-mile Snaefell Mountain Course in 2016. "That's the great thing about motorcycling and road racing, I love being connected to all the heritage." Costello was recently unveiled as the first female president of the TT Riders' Association in its 67-year history, and will continue to make a piece of racing history on the track heading into the new racing season. Costello is aiming to become the first woman to race both sidecar and solo machinery at the same Isle of Man TT meeting after announcing her partnership with Julie Canipa for the 2019 season. After encouraging other females to get involved with motorsport, Costello is aiming to become the first woman to race both sidecar and solo machinery at the same Isle of Man TT meeting. She recently celebrated International Women's Day by securing a deal to race the sidecar at this year's TT. Julie Canipa, who last year was awarded the Susan Jenness Trophy by the TT Supporters' Club for her fantastic efforts in the event, will be her new passenger. There is still work to do if more young girls and women are to break into the sport, but Costello's fire is still burning to inspire the next generation both on and off the race track.